Blockchain is a decentralized technology in which the digital ledgers are recorded chronologically and public. JASStek is currently implementing cross continent logistic use case. JASStek is engaged with a customer on managing ledger generated during the procurement process. JASStek's solution towards encrypting blueprints and Databases with military grade specifications. JASStek has developed a Blockchain roadmap in 3D printing, a proprietary solutions currently being looked at by three different NATO countries. 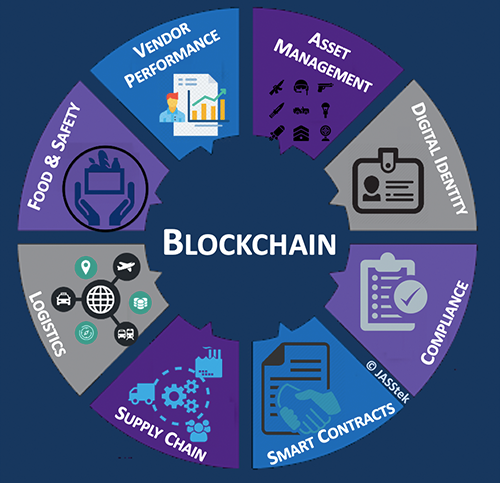 JASStek is engaged with federal agencies regarding the use of Blockchain in Operational Readiness, Food Safety, Equipment tracking and Troops health records. JASStek has implemented Blockchain for identity management and created public and private keys. Contact today, for conversation with Blockchain thought leader, to help you reinvent your business.